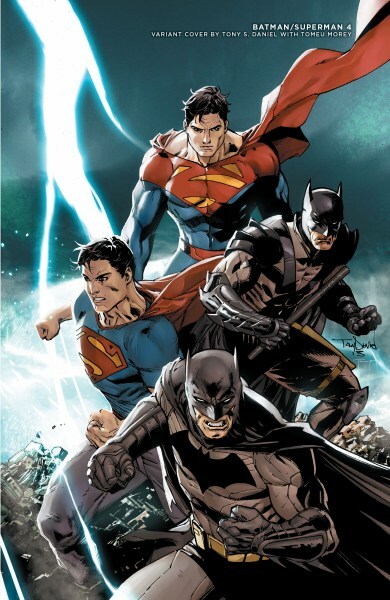 Depending on how much you adhere to the concept of “self-canon” when it comes to DC’s New 52 (that is, you pick for yourself what still applies in the new universe and what gets left behind), the first volume of Batman/Superman may or may not feature the very first chronological interaction between Batman and Superman. At least, it’s chronological if you ignore the the nine other occasions they first met listed in this article (featuring Cross World as the tenth). Canon’s a tricky thing, innit? At absolute least, Cross World negates the alleged first meeting setup in the New 52’s Justice League opener. So for the purposes of this review, just imagine it really is their first meeting and the reason they didn’t recognise each other in Origin is coz the DC Editorial team mind-wiped them between the former and latter books. That, or DC once again have a problem with fluid continuity (though many would argue that problem’s existed for a very long time now). Ok, sorry. Review. Book. Things. 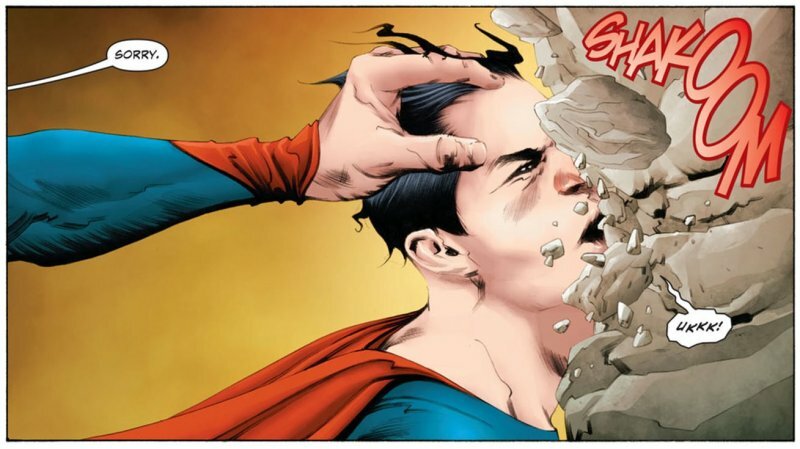 To get back on topic, here’s a picture of Superman getting face-smashed against a rock. Despite its conflicting nature with the rest of the DC ‘verse, Cross World is a surprisingly enjoyable book. As has been painstakingly and repeatedly pointed out, it’s the first meeting of Bats and Supes; technically, it’s the meeting of the Bats and the Supes from both our ‘verse and that of Earth-2. Y’know, the same setting as that Earth 2 book currently running where both they and Wonder Woman met grisly deaths in the first issue. Fun, fun, fun! Both sets of super-duos meet and cross dimensions due to some magical temporal shenanigans, causing havoc. There’s also an imp dude ripping off Puck from Shakespeare’s A Midsummer Night’s Dream, and an issue tacked on at the end of the book dealing with what I assume is a reboot of Darkseid’s origin story. I did say Cross World is enjoyable, but not for the story per se. I’m writing this review a good month after reading it, and without the book close to hand I’m struggling to remember plot points. It’s not so much a coherent A-to-B story as it is a string of scenes stitched together with some connectivity but not much in the way of proper plot. 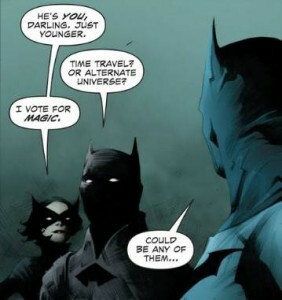 Granted, getting the Prime universe superheroes back to their depressing reality is kind of a thing, but I’m pretty sure that gets easily resolved towards the middle or end. Or maybe it didn’t, and my gaps in memory are being filled by crossings with other books. I dunno. Ugh. I give up. Canon conflicts do my head in. As if the previous few paragraphs of ramshackle sentences masquerading as proper analysis didn’t clue you in, the story’s hard to judge. As I said it’s not so coherent as it should be, especially with an interesting premise like crossing to other dimensions. Taking the elements the book presents on their own, it’s pretty good. As a story it completely falls down, but that doesn’t make it bad; what scenes we have here that make sense are good. The Earth-2 versions of the heroes are pretty great. The Darkseid origin story is fantastic (and a great bonus on its own for anyone buying the book). Dialogue by Greg Pak is a little scratchy at times, but mostly functional. All pretty standard. What elevates Cross World from “functional” to “entertaining” is the artwork. 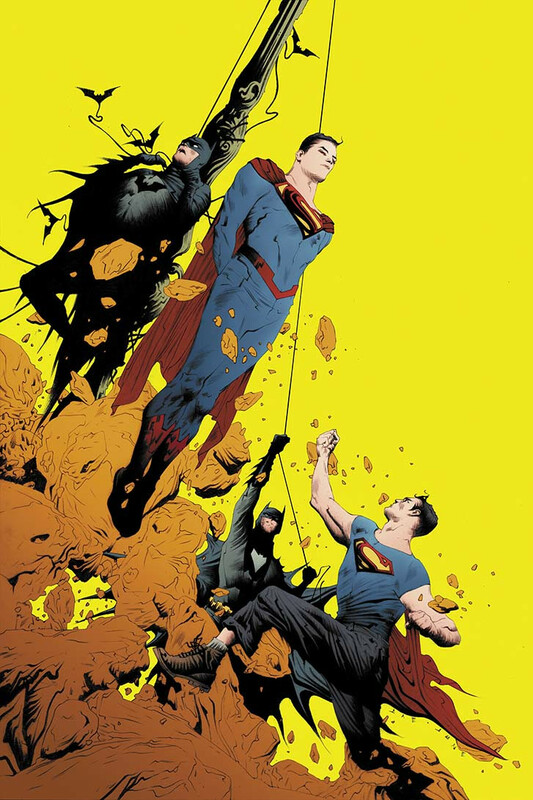 I’ve never seen Jae Lee’s work before, but dammit if it isn’t bloody gorgeous. It’s the sort of surreal, Lovecraft-meets-LSD take I love in books like Sandman but not so much Captain Marvel, and if nothing else the distinct visuals set Batman/Superman apart from any other Dark Knight or Man of Steel books on the market right now. It’s weird, striking, creepy, symbolic and evocative. My hat (if I wore on) is off to Lee for taking a fairly standard and disjointed story and making it look gorgeous. Wait, what’s that? 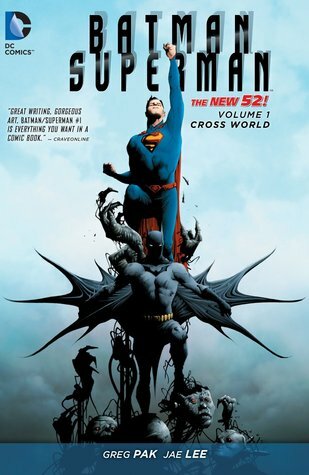 You read the pre-reboot Superman/Batman series that garnered acclaim and went for a long while? You wanna know how the new, name-reversed iteration stacks up against its predecessor? Well, you’re lookin’ in the wrong place. I never read it, but from what I’ve heard others say it sounds like the new volume is pretty distinct from the old one. Apparently the latter had a comprehensible plot, if nothing else.